Wishing for Summer - monemades Webseite! So the summer has started - at least when you go by the seasons according to the meteorologists - but it doesn't feel like summer at all in my neck of the world. Too cool, nasty wind, too much grey... hard to take for a sun loving person like I am. Funnily enough not much rain, so all the farmers and gardeners are complaining too, but for different reasons. Isn't it just perfect that we cannot change the weather? There would never be a consent what is best, lol. Anyway, some work in the garden has to be done, no matter if I fully enjoy the weather, but I admit that I preferred this weak's task: to take care of our garden decoration, so an indoor task. 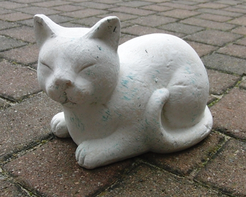 A couple of years ago we bought this stoneware cat and over the years the weather took its toll: it was just plain white with some weird green (!) strikes. Not catlike at all. Now, I’m not really talented when it comes to paint something, but I did my best and then found the cat a place a bit hidden in the flower bed and from afar I think it looks quite nice. 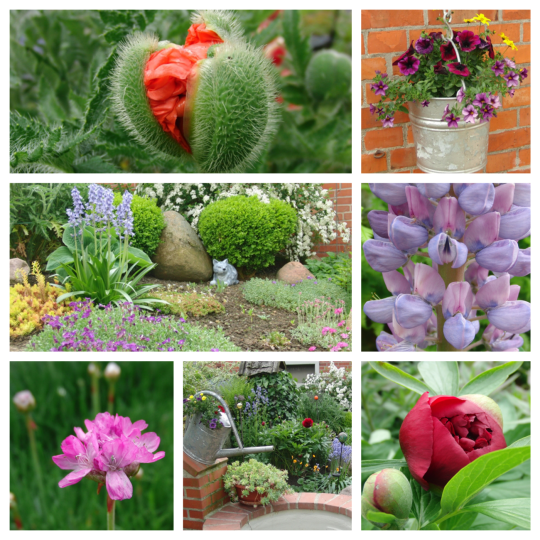 Now to wait for summer to get into full swing, so that we can enjoy not only the newly painted cat but also all the flowers blooming in our garden. Do you spy the cat?